You’ve thought about it for years: owning your own brand. You know its market position, the product lineup, where you want to see it sold. It seems so easy, yet so many fail. There are many reasons why new brands fail, but the number one reason is a failure to understand the intangibles of brand building. The tactics are the “fun” part: the website, the e-blasts, the packaging and product development, but what’s your strategy? Have you evaluated the intangibles that can put you on the road to success? Ignoring these elements can crush you before your brand has a chance to make its mark. Here are five questions to ask yourself about brand building before getting started. 1. How courageous are you? Estée Lauder once said “Risk-taking is the cornerstone of empires.” Be like Estée. Have the courage to take calculated risks. Building a brand from scratch takes guts. Your role as brand owner is to give your brand what it needs to survive and thrive. It means taking risks. You’ll second-guess yourself and stress over it, but if you have the courage to do it, your brand can be great. Understand the difference between calculated risks, gut instinct and reckless behavior. Sometimes you need to go with your gut, and this usually leads to a calculated risk-taking, which is how you grow. Working outside your comfort zone leads to amazing things. 2. How well do you play with others? There will be a small army of people who help you succeed. They bring an expertise curated from years and years of experience. Everyone has a super power, but few people have several. To succeed, you need an army of people with a complimentary set of super powers to your own. Respect what they bring to the table. Listen to them—especially when they challenge your belief system. Don’t take it personally. Candid, tough discussions help you grow. Can you set aside what you want to believe is true and let experts help you identify what is actually true? Yes, you’re the brand owner and it’s your money, but if you have to be right all the time, you’re going to fail. Remember: no expert can help someone who can’t or won’t accept it. Option 1: Your website expert has convinced you that building an e-commerce website on WordPress using Woo-Commerce is the right thing to do. It’s a solid recommendation. WordPress is free, it’s easy to update and it’s a flexible platform. What exactly could go wrong? A lot! WordPress, while free to install, comes at a high cost. How much will you spend on hosting, security and firewall protection, platform updates, plug-in and extension costs, optimization and so forth? According to Elegantthemes.com, it can cost between $500-$2,500 per month to maintain a WordPress site. Option 2: You go with a hosted platform such as Shopify or BigCommerce. You pay a flat monthly fee for the platform, which includes platform updates, hosting, security, reporting, basic marketing, transactional e-mails, a shopping cart, account pages, etc. There are apps you can add to enhance the site. Some will be free and some will come at a price. Are these platforms recommended for everyone? Absolutely not, but until you’re earning $250,000–500,000 a year at your website, hosted platforms are a viable option. What would it mean to your brand growth if you had a budget of $2,500 a month for marketing and sales? It means you can invest in revenue-generating activity, build a customer base and put your brand on a path to success. Most owners of new brands are self-financing, which means they anguish over every decision. Don’t fall victim to paralysis by analysis. Overthinking can kill productivity and creativity. When you have a minute, watch Daniel Gilbert’s TED Talk, “Why We Make Bad Decisions.”* It’s essential to understand how our brain is wired to assume what makes us happy, which can lead to poor decisions. For example: people tend to compare the present to the past, rather than to what’s possible. If the past is a major influence in your decision making, you’re not looking to the future. You’re de-valuing what’s possible, rather than creating a framework for what’s possible to become a reality. 5. How sharp are your storytelling skills? In the olden days—like, 10 years ago—brands and retailers controlled the conversation. That’s not the case today. The customer controls the conversation—and that changes everything. Why do you exist? Answer this without any pronouns (I, you, he, she, they, it). Why do you want to solve your customers’ problem? How generous can you be with information that helps solve it? Be interesting by giving something truly helpful and innovative. Connect on an emotional level with your audience. Create two to four marketing personas you’ll target and tell your story in a way they can relate to. Speak to them in their language. How connected is your story to your brand strategy? The two are inextricably linked, so if you think you don’t need strategy, then you should prepare an outcome that your brand story likely won’t sell. How will your story be told by others? User-generated content (UGC) is the name of the game in social media. Accept that UCG will be shared more than virtually anything you create, which makes crafting your story from an outside point-of-view even more important. 5.1 Can you honestly say that you’re ready to build a brand? Please say yes, because it’s really an incredible experience. 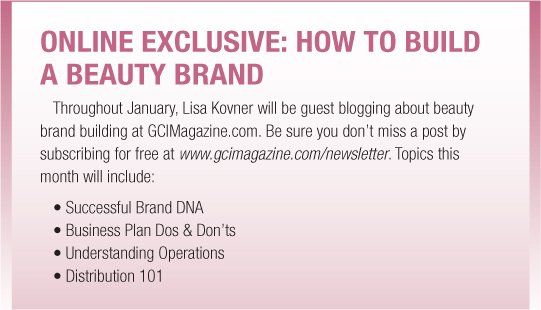 Look for Kovner in the March issue, where she’ll be discussing branding. Lisa Kovner (lisa@kovnercompany.com) is the founder of Kovner & Company, which propels brands forward using influencer-based and non-traditional marketing strategies for consumer, retail and distribution channels.